Ta Dzong is located on the left bank of the Mangde river and above the Trongsa Dzong and itself is a grand circular five-storied tower along with another two towers. 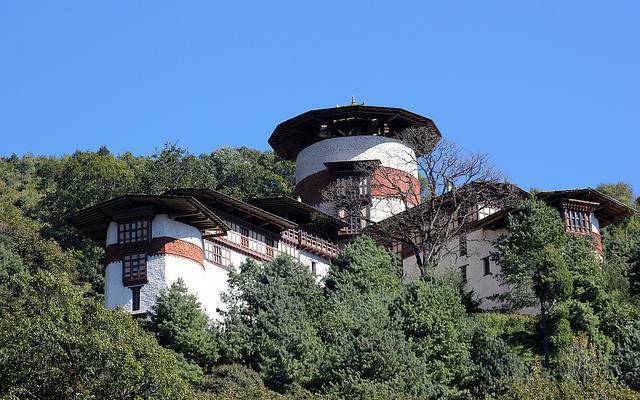 It was built by the first governor of Trongsa, Choeje Minjur Tenpa, in the year 1652. There are two temples in this dzong, one is dedicated to the legendary Gesar of Ling and another one is dedicated to Maiterya also called the Buddha of the next age. The museum which was inagurated in the year of 2008 has a total of eleven galleries. One of the galleries showcases the history of the kings of the Wangchuk dynasty while another one provides a glimpse about the history and religious importance of the Trongsa Dzong. The dzong is an important centre as it plays a significant role in preserving the valuable artifacts of Bhutan’s history for the people. It also propagates the history of Bhutan and is a major place of attraction for both the tourists as well as the local people.